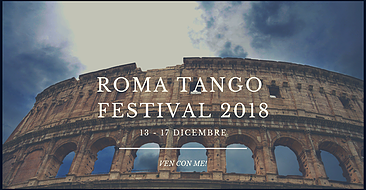 ROMA TANGO FESTIVAL - Ven con me! Vi aspettiamo per abbracciarci nella magnifica Capitale. Welcome to the 6th edition of Roma Tango Festival, a truly special event for every tango lover. Four fantastic days and nights to celebrate the most magical time of the year in the heart of Rome. 9 intense hours of workshops, 4 milongas, 3 tango brunches and an opportunity to meet and learn from dancers and instructors from different schools and countries! This year, Roma Tango Festival is all about collaboration and sharing, and we are absolutely thrilled to share our tango love with the guests from all over the world! Sabato - Saturday "Los Latinos LA MIRADA"
Domenica - Sunday "MUST milonga"